You cannot go to India without thinking about the relationship between Christianity and other religions, at least if you are a theology professor and an Orthodox priest. The intersection of various spiritual traditions really slaps you in the face with sacred cows, temples, pilgrims, calls to prayer, and many other reminders that this is a part of the world where faith in so many forms is a lively presence. There have been Christians in India since St. Thomas the Apostle, but they remain a small minority. Both the evangelical ministry which hosted our group from McMurry University and the Malankara Orthodox Syrian Christians whom I met were quite comfortable working with and serving people of whatever religion. The evangelicals spoke of bringing people to Christ and the Orthodox maintained their traditional worship and sacramental life. Both sponsor ministries to needy children of many different faith communities. The evangelicals run a school with a Sikh principal, Hindu teachers, and a tiny minority of Christian students. They also minister to a colony of lepers that includes Hindus and Muslims. 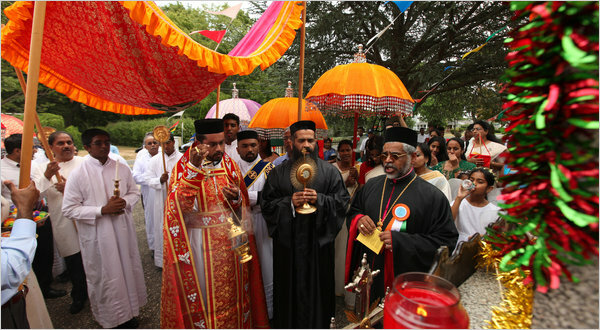 The Orthodox mentioned that Hindus and Muslims sometimes come to services on major feast days. A guide told us that most of the visitors to a famous mosque in Mumbai are Hindus who venerate the relics of an Islamic holy man. The Orthodox also told me that one of their Indian saints is commonly venerated by both Muslims and Hindus. To put it mildly, these interreligious dynamics are a bit more complicated than the ones I encounter in West Texas. Both evangelicals and Orthodox commented that conversion to Christianity is a complicated matter in India, but not impossible. Though the general Christian experience there has not been one of persecution, since returning home I have read reports of an increase in anti-Christian violence in some parts of the country in recent years. Some Indian states have passed anti-conversion laws in response to Hindu nationalist appeals. I was told that it is virtually impossible to change one’s religion or caste in official government records, but that in practice conversions definitely do occur. “Preach the gospel at all times. When necessary, use words.” That quotation, attributed to St. Francis of Assisi, came to mind in observing Indian Christians of whatever stripe. To bear witness to the good news of Jesus Christ is a fundamental Christian practice which may be carried out in a variety of ways dependent upon the circumstances. Actions often speak louder than words and a picture (such as an icon) is worth a thousand words. The Lord invited His first disciples to “Come and see.” The emissaries of Prince Vladimir were drawn to Orthodox Christianity because the beauty of the Divine Liturgy was such that they did not know whether they were in heaven or on earth. To offer the worship of the Church and to demonstrate Christ’s love to the needy are both ways of becoming a living icon of God’s salvation that invites others to enter into the joy of the heavenly kingdom. Too much focus on the abstract question of the eternal destiny of adherents of other religions leads us, however, to matters beyond our rational knowledge. People find salvation as persons in relationship with the Lord and one another, not due to our knowledge of ideas, even when they are about God. Jesus Christ is surely the only Savior of the world, but the parable of the Last Judgment in Matthew 25 provides hope that some serve Him well without knowing that they do so. Created in the divine image and likeness, all human beings can do better or worse; and the more truth we have received, the greater the expectations. The witness of Indian Christians reminds us to live out what we say we believe with integrity, even as we bow before the mystery of how others relate to Him. As Christ taught, we will be judged by the same standard we apply to others; so it is good to be careful to focus on taking the logs out of our own eyes first. St. Seraphim of Sarov said “Acquire the Spirit of peace and thousands around you will be saved.” That is the Holy Spirit, of course, and it is by His presence in our lives that we may become living icons of God’s salvation and partakers of the divine nature (2 Pet. 1:4). If we want to live the kind of lives that point others to Christ by showing them His love and holiness, we must be transformed by the One to Whom we open ourselves in prayer, worship, and all the spiritual disciplines of the Christian life. Whether in India, America, or elsewhere, Christians will be of no use if we are not enlivened by the same Spirit Who overcame national and linguistic boundaries on the day of Pentecost and even united Jews and Gentiles into one body. Those whose lives manifest the presence of the Holy Spirit cannot help but be true evangelists as signs of what happens to human beings in whom God dwells. India is a complex and confusing place, at least for this recent visitor. But the focus of Indian Christianity seems to be as clear as this admonition from St. James 1:27: “Pure and undefiled religion before God the Father is this, To visit orphans and widows in their distress, and to keep oneself unspotted from the world.” Surely, there is no better way to proclaim the gospel.